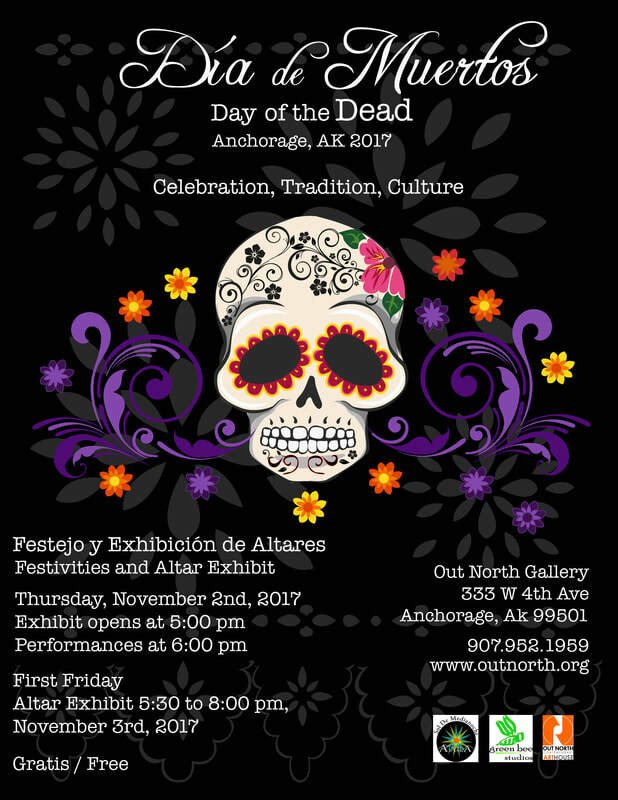 ​Everyone is invited to celebrate, participate and attend the annual Dia de Muertos and altar exhibit, which will take place at Out North Contemporary Art House in downtown Anchorage Alaska on Thursday, November 2, 2017. This event is free. The event will feature altars by local artists, community members and community groups. In addition, there will be space for a community altar for anyone who wants to contribute an offering for his/her loved ones. Mexicans do not die once; Mexicans die three times. The first death is when the body ceases to function; when the heart stops, the gaze becomes hollow and the physical space we occupy becomes inconsequential. The second death comes when the body is lowered into the ground and returned to earth. The third death, the most definitive death, is when there is no one left to remember us. El dia de muertos illuminates the Mexican philosophy of living; it is in this day that we reconcile our past and present, our ancestors with ourselves. We acknowledge our mortality and the place of dying in the cycle of life. El dia de muertos is a celebration of life, a remembrance and intimate moment in which we care for and honor our deceased family and friends. It is through this celebration of death that we continue to live and cheat death of our third and final death. Do you have questions? Would you like to make an altar? Would you like to donate or volunteer?